This article was created in partnership with Microsoft. Thank you for supporting the partners who make SitePoint possible. Typically, each native OS and platform has its own build tools, testing tools, and deployment tools. This often implies that you need separate Continuous Integration (CI) and Continuous Delivery (CD) pipelines for each platform you are working on, thereby duplicating or triplicating your efforts. Microsoft’s Visual Studio App Center is one of the best ways to deal with the fragmentation of the mobile development landscape: it seamlessly centralises all your Continuous Integration and Continuous Delivery needs in a single place, supporting any platform and framework you may need, including iOS, Android, Windows, macOS, Xamarin, and React Native. This present tutorial will show you how to use App Center to build, test, and deliver a very simple native Swift iOS app. Note: You’ll need Xcode 8+. If you’re following this tutorial to integrate the App Center SDK into an existing app, your app must target iOS 8.0+ and cannot use any other crash reporting library. Also, this tutorial will assume you have a good working knowledge of Git. Note again: If you’re already familiar with Continuous Integration or Unit Testing, you can skip to the Wrapping up tests section. If not, follow along. I’ll create a very simple app and some tests to demonstrate the value of Continuous Integration by showing the many ways in which even something seemingly simple should be tested for bugs, and the ease with which this can be achieved in App Center. I’ll also go over App Center’s Continuous Delivery features and show how painless it is to send your iOS builds to internal and external testers. Our local burger shop has asked us to build them an app with a simple daily calorie counter, which can also tell the user how many hamburgers they can have without exceeding their daily calorie intake. Let’s assume that a teammate is taking care of the UI, we’re just going to work on the app’s back-end logic. 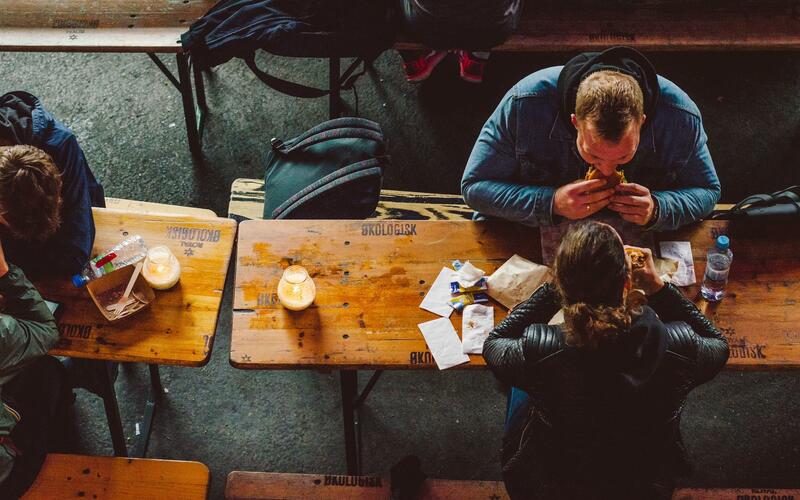 The client are called Reliable Burgers because they can be relied upon to provide food that’s of the highest quality. A bold claim, but it’s backed up by all the 5 Star restaurant reviews they’ve received. But because they’re not the type that simply make or accept “bold claims” they want independent validation from us that our code will also produces the expected results. To this end, they have employed a large team of internal and external testers to receive the latest changes to the code as soon as they’re committed to the codebase. This is where the Continuous Integration and Continuous Delivery features in App Center can help. Whenever the user consumes food, they’ll input the corresponding amount of calories using the add method, which updates totalCaloriesConsumedToday. hamburgersICanStillEatToday computes how many Reliable Hamburgers the user can still eat that day (we just divide the calories the user can still consume that day by the number of calories in a Reliable Hamburger (550)). That’s it, looks like we took care of all the requirements! Let’s commit, push, send to the testers, and we’re done for the day. The app said I could still eat more than 2000 Reliable Burgers, so I bought and ate 20 and now I’m not feeling too well! So clearly our code needs fixing. But rather than just applying the fixes, we should also write tests to ensure that these bugs won’t appear again. Assume totalCaloriesConsumedToday is 0 and caloriesPerBurger is 550. The operation is: 2200 - 0 / 550. The bad result is due to our ignoring an elementary rule of maths: divisions are carried out before subtractions. Swift follows these rules to the letter, so it starts by dividing 0 by 550, obtaining 0, then subtracting 0 from 2200. hamburgersICanStillEatToday is thus 2200 when totalCaloriesConsumedToday is 0! 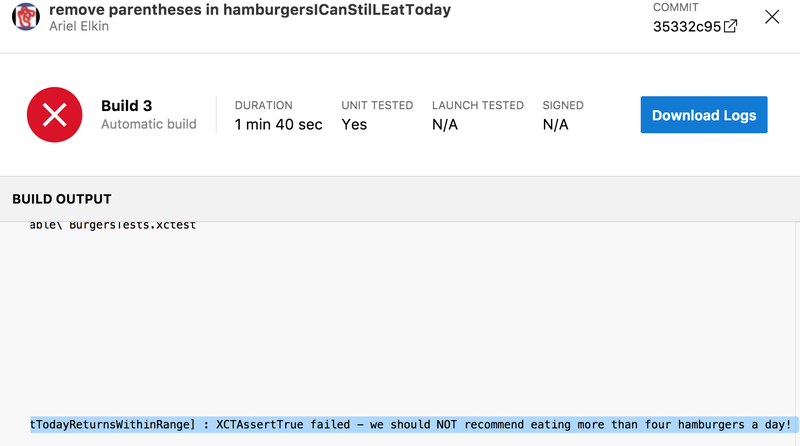 Before we write a fix, let’s ensure that we never again tell a user they can eat 2200 burgers! 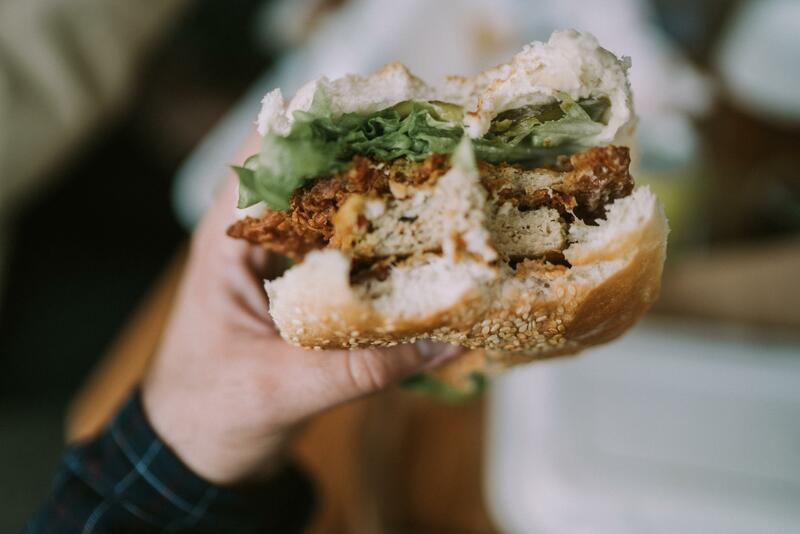 Assuming that a human should consume approximately 2200 calories a day, and that a burger is approximately 550 calories, hamburgersICanStillEatToday should never return a number above 4 (a figure we get by dividing 2200 by 550, keeping our users (and our client) happy). 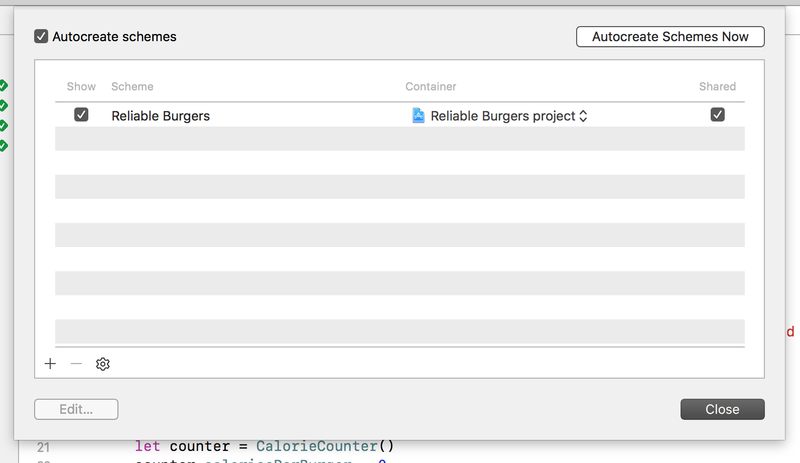 This test method will recreate the scenario our above user encountered by creating a new CalorieCounter from scratch and querying it for hamburgersICanStillEatToday. The XCTAssert methods will expect the expression within their parentheses to be true. If all XCTAsserts pass, the test passes. If one or more fails, the test fails. 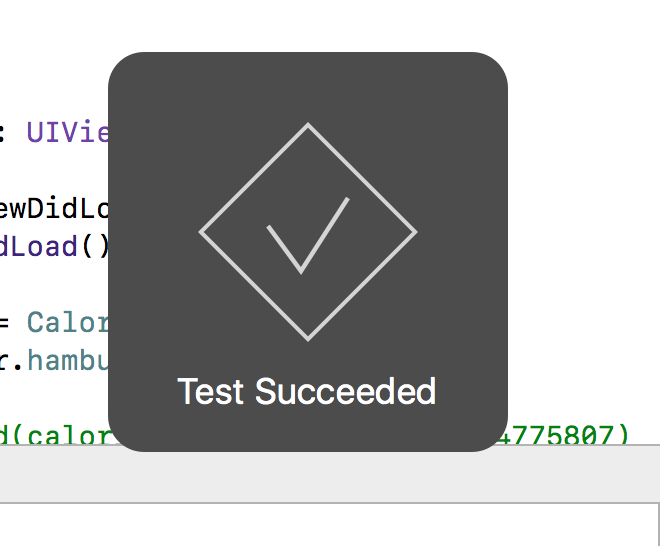 These two tests ensure that the two bugs we identified earlier on don’t sneak into our app again. We must now make sure that these tests pass before new code is merged into the codebase, and before an app is sent to users. App Center will make it easy for us to ensure this! In order for App Center to build our Xcode project, we need to share the Xcode scheme. To share a scheme, alt + click on Xcode’s run button, click on Manage Schemes, and ensure the Shared box is ticked. App Center can build and test our app once it’s hosted on GitHub, Bitbucket, or Visual Studio Team Services. Continuous Integration always works in tandem with version control. 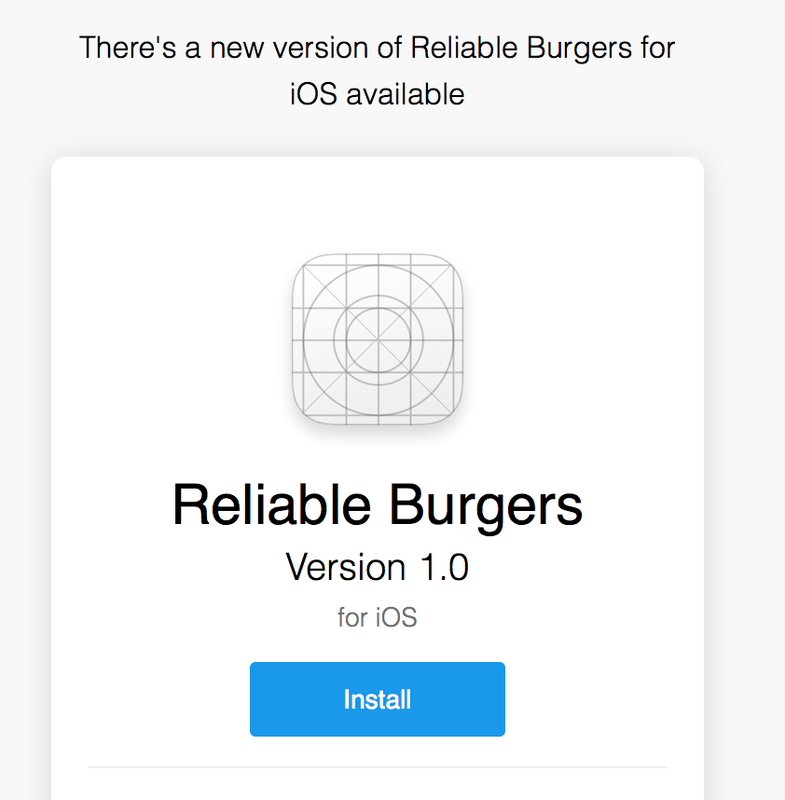 Once you’re in, click on Add New App, set Reliable Burgers as the name, select iOS as the OS, and Objective-C/Swift as the platform. In App Center’s left column, click on Build, connect your hosting service if needed, and select your repository. Turn the Run XCTest tests to On. We want the build to fail if any of the tests fail! Click on Save & Build. Builds usually take a few minutes, but you can click on it to see the real-time output of the build process. By default, every time we push code to the master branch, a build will begin on App Center. We can configure builds to start when code is pushed to other branches too. We thus have an efficient Continuous Integration pipeline that ensures the latest commits don’t break builds or fail tests. It may look like an exercise in sabotage, but on the other hand, this emulates a (more likely) scenario in which, say, a teammate commits these changes accidentally. Most apps feature complex UI workflows your users go through. This is a result of the many different possible combinations of views, view controllers, and segues between them. Auto Layout does a lot of the work ensuring that the layout stays consistent across different OSes and devices. Ultimately, UI Testing is the best way to ensure that your app’s dozens (or hundreds) of possible UI workflows stay the same as your codebase evolves. 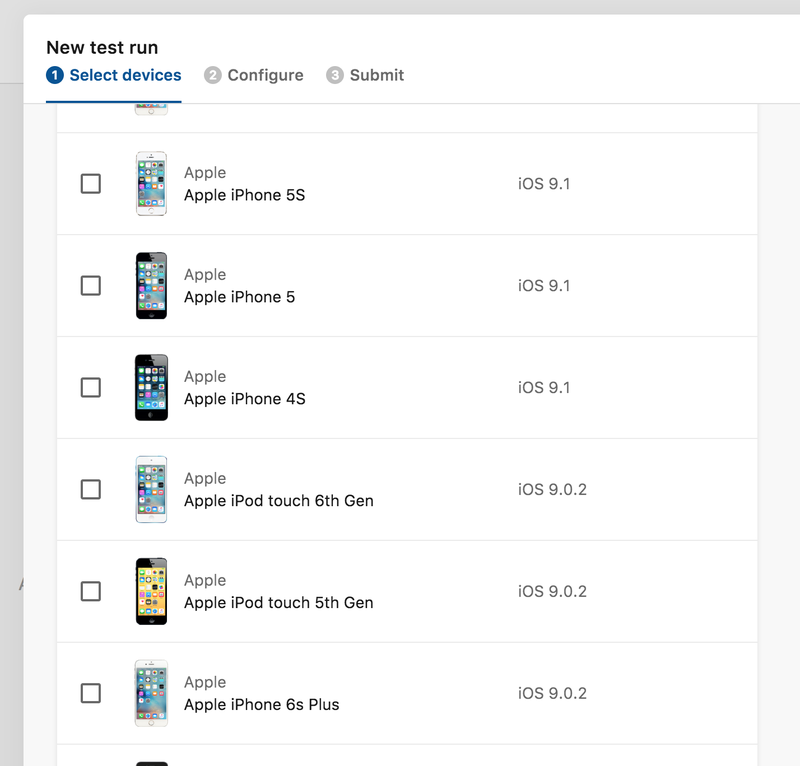 One killer feature of App Center is that it allows you to run automated UI tests across hundreds of device configurations with every build (or on demand). This means it will run your tests on a massive combination of iOS devices and OS versions. App Center Test uses devices that are not rooted or jailbroken, which allows you to reliably and automatically reproduce your users’ environments. It even provides you screenshots and device logs for each test run. You’ll also need to sign your builds and turn on the Test on a Real Device option in App Center’s build configuration. Let’s get this app into our users’ hands! I’ll now go over the steps required to send a build to testers. We first define a Distribution Group, then send the build to it. These groups are very useful to ensure the right build goes to the right people. For instance, you may create a group for internal testers (such as QA), and another for external testers (such as those in a public or private beta). In App Center’s left-hand column, click on Distribute and then on Groups. Click on New Group on the top right corner. 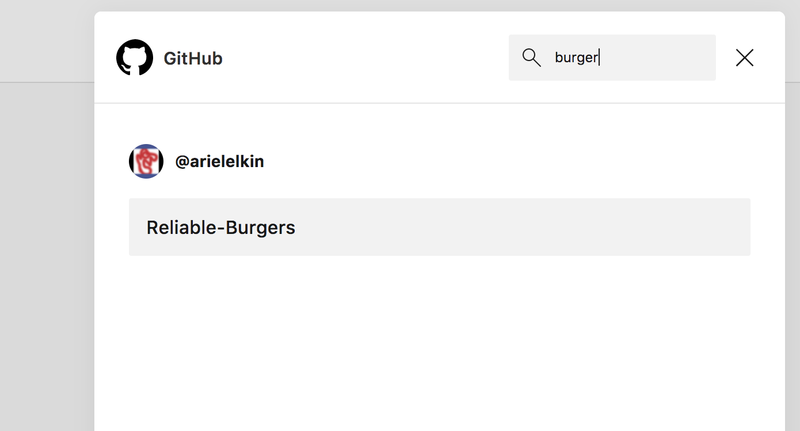 This will be the group of internal testers (for instance, all the stakeholders at Reliable Burgers), so go ahead and create a group called “Internal”. (Note the Allow public access switch which allows you to effectively make the app available to anyone with the download link, a feature you may use for external testers). In the section Who would you like to invite to the group? add your email address. Next, we need to code sign the app. We’ll need a Provisioning Profile and a .p12 Certificate. Both ensure that only the people you specify are allowed to distribute the app. Go into the Provisioning Profiles section. Find the provisioning profile you need (with a .mobileprovision file extension), select it and click download. Otherwise, you can create a new provisioning profile (one for iOS App Development if you’re sending it to testers, one for App Store if you’re sending the build to the store). Make sure that all devices meant to receive the app have been added to this profile! Now we download the certificate. Go into the Certificates section. Select your certificate, and click Download. Open the file that’s downloaded (it should automatically open in Keychain Access) and select Add. Then, in Keychain Access, select the My Certificates section, right-click on the certificate you just added, and select Export. It will allow you to save it as a .p12 file (set a password and note it down, as you’ll need it in the next step). In App Center, select your build, and select Build Configuration by clicking on the wrench icon on the top right part of the screen. Scroll down to the Sign section, and upload the two files you’ve just downloaded. Include the password for the p12 file. Set the Distribute Builds switch to On, and click on the group we just created. Archive and export the app in Xcode, and use this command-line tool to extract the provisioning profile and certificate from the resulting ipa. In this tutorial, we’ve noticed how Visual Studio App Center smoothly helps us centralise all our Continuous Integration and Continuous Delivery needs in a single place, as all the above steps are exactly the same for Android, Windows, macOS, Xamarin, and React Native builds. 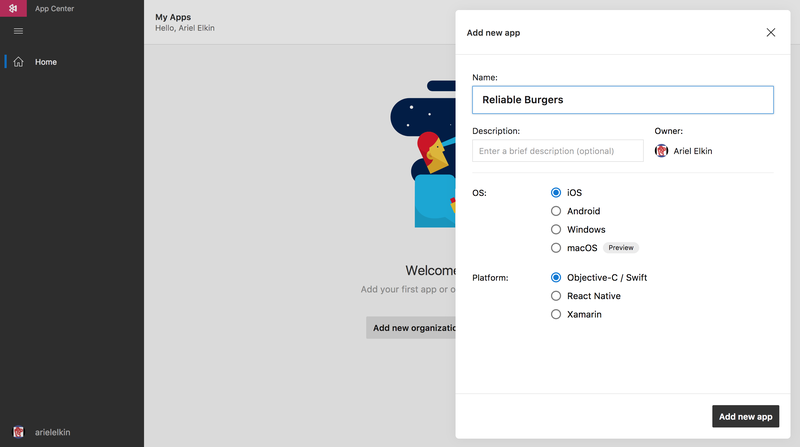 The Continuous Integration features in App Center allow you to constantly build apps, test them, and catch bugs before they go to production, while the Continuous Delivery features allow you to easily and automatically send apps to your testers and the App Store. (Cherry on top, App Center can also take care of your app’s analytics, and we’ll cover App Center analytics in our next tutorial. By thus allowing you to iterate faster, this great tool will help you build and ship great apps for the years to come.